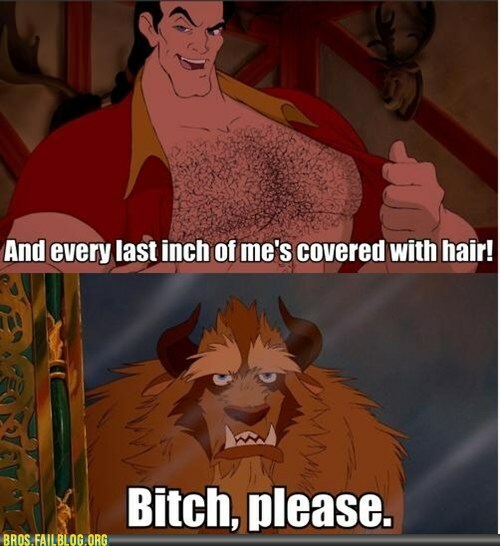 I am giving Gaston a run for his money on levels of testosterone. Waxing is a way of semi-permanent hair removal which removes the hair from the root. New hair will not grow back in the previously waxed area for two to eight weeks, although some people will start to see regrowth in only a week. Try 3 days. And in 3 days, I am not seeing a little, “oh, yeah -looky there… some hair is starting to grown back in.” It’s like that movie “The Santa Clause” when Tim Allen shaves, lets out a sigh of relief, and then his full white beard grows right back. I am wondering what it would look like if i just let it go. If I just didn’t touch it, would I turn into Teen Wolf? Some of the hairs are dark brown, some are red. I bet I would have a very pretty auburn beard. I already had PCOS symptoms, which I believe (although I never had the levels checked) includes tons of extra testosterone anyway. So, I don’t know… I guess I should just wait it out, hideout inside my house while it grows out and then flee to the salon under a bandana on Friday and get it waxed again in time for the shower. Or should I continue tweezing like a crazy person? Or should I use the Hair Removal Creme? Or should I buy a kit and wax at home? I had used the creme, and (as it turns out) it lasts about as long as the waxing did! Ha! The girl at the salon looked at my face and was like, “yeah, shaving is the worst thing you can do…” Do I look stupid to you? I absolutely wouldn’t shave it, ever! “I tried hair removal creme a couple days ago.” She did not look convinced.